Yes and I think as a mom that is one of our greatest fears…for people to say that we are unprofessional…because of our children. And with a virtual summit, it can be very tricky. I know I usually try to plan my interviews around when I know my daughter will be in school or my husband will be around to take care of her. 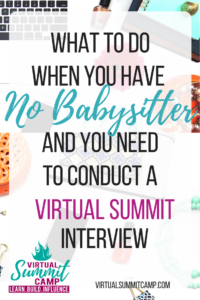 But sometimes… when lightning strikes, and there’s no other option but to run the interview with my daughter in the house and no babysitter I have a few trusted tricks that I keep up my sleeves. Realize that there is no fool proof method, no matter how prepared you may be, your children are superhuman and can find ways around your plans, so your best bet is to forewarn the interviewee (lol) let them know that your children are around, but that you will do your best to keep them as quiet as possible. As soon as you know that you will be alone with your child keep something away from them that they love – their favorite book, movie, ipad game, youtube video etc. Don’t let them have it the whole day until right when you’re about to conduct the interview – that way when you give it to them they will still be curious and interested in it. If they’re young enough you can keep them restricted somewhere safe – put them in their high chair, and place them in front of the tv with lots of snacks and drinks, make sure you take them to the restroom before your session (and pray they don’t need to use the restroom again). Beg beg beg, bribe bribe bribe – let them know how important this is to you, and promise them whatever you need to promise them in order to get them to cooperate. These usually work for me, have you tried any of them? What others would you recommend? 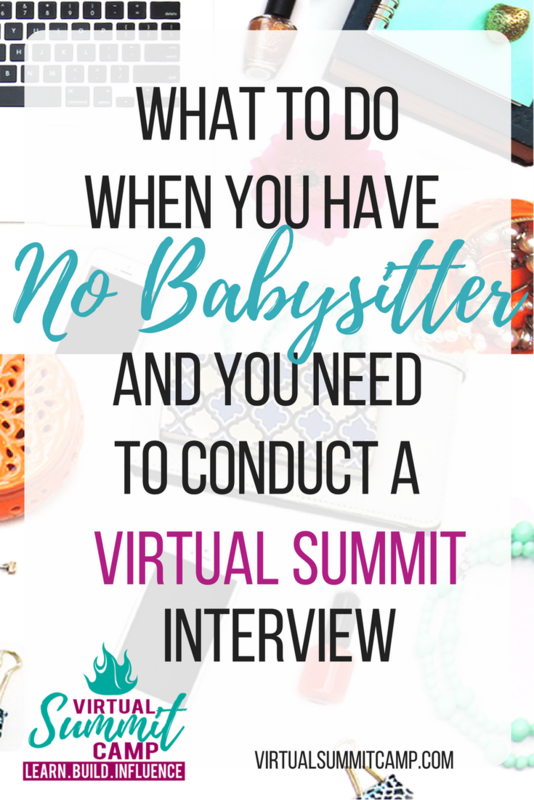 If you’re looking at running your own virtual summit soon, you can get my free virtual summit checklist by clicking here.